KB Play Dat Shss vol 2. From promoting college parties on the Tuskegee University campus at 17, to managing one of the largest nightclubs in the southeast region, Kevin KB Burns has always had a love for music. 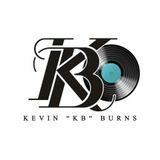 Growing up listening to legendary DJ’s such as Farley, Gene Hunt, and the Boolumaster among others helped to build Kevin KB Burns’ musical foundation. Living in Alabama, New York, Atlanta, and Canada gave him a different perspective of music that he later came to appreciate because it was so different from the sounds that were dominating Chicago.